This past weekend, we had the privilege of attending KidLitCon 2011 in Seattle, and we had the best time ever! Every good thing you've ever heard about this conference? It's ALL TRUE. KidLitCon is a wonderful venue for authors, bloggers, librarians, teachers, and readers to come together and share a mutual love of children's and young adult literature. Plus, we got to meet Scott Westerfeld! 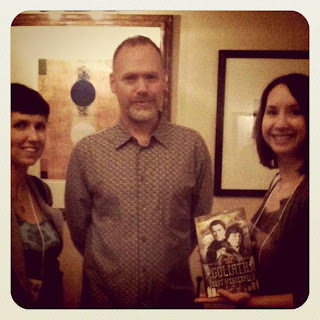 And, okay... maybe it's silly to post this picture, because he isn't actually on the special KidLitCon edition podcast we're offering for your listening pleasure, but hey... if you had a picture with Scott Westerfeld, wouldn't YOU post it? Mr. Westerfeld was extremely nice and we hope to feature him on the podcast sometime in the future. While at the conference, we presented on podcasting and adding a voice element to blogs. It was so much fun! As part of our presentation, we recorded book recommendations from the authors and bloggers at the presentation. We got some great ones and are so excited to share them with you! So here you go, the extra special Authors are ROCKSTARS! - KidLitCon edition! Want to download a mp3 of this podcast? Click here! Thanks for posting this. I missed your session because I was in the other one, and it sounds like it was a great session! You two sound like so much fun that I'm going to have to start listening to your podcast!